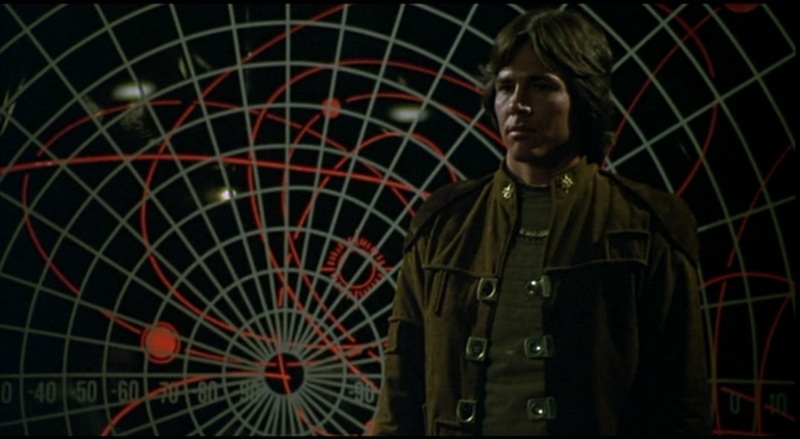 Our summer season of Star Wars cash-ins comes to a crashing finale with the much-maligned Battle Beyond the Stars, a movie so derivative that it recycles sound effects from Battlestar Galactica, making it a cash-in of a cash-in. It’s also a remake of The Magnificent Seven, with George Peppard in the Steve McQueen role and Robert Vaughn in the Robert Vaughn role, which was itself a remake of The Seven Samurai… could you tell that Roger Corman produced this? 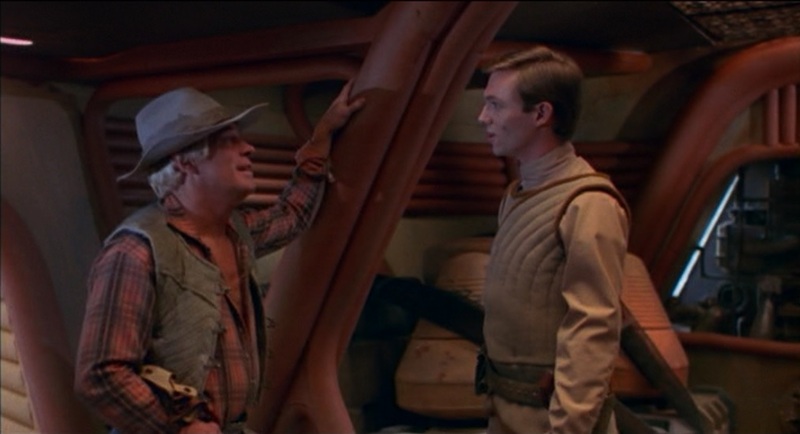 Actually, one of the most delightfully Cormanesque qualities of this movie is that all of the principal actors, except for John Saxon, who plays the Vader Villan Sador, were probably only required on set at the same time exactly once. 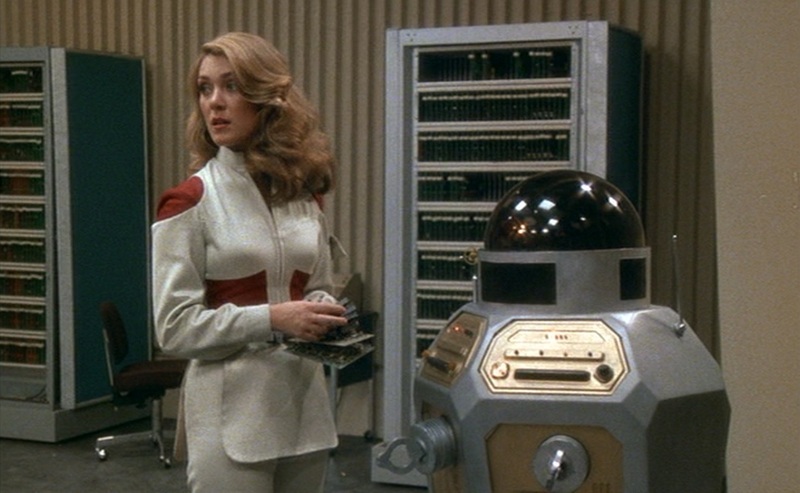 Saxon never interacts with any of the principal characters, who also include Richard Thomas, Sybil Danning, Marta Kristen, and Sam Jaffe, who plays a cyborg. I think that if I were casting a movie in 1980, Sam Jaffe would not be the first name I’d come up with to work for about eight hours as a disembodied head stuck on top of a bunch of wires and machinery. I can’t credit this turkey with much of anything myself, except that I was genuinely impressed with at least the first two-thirds of the script, which is lean and mean and moves absurdly fast, all character and nuance chopped for the bare bones of a fast-moving plot. 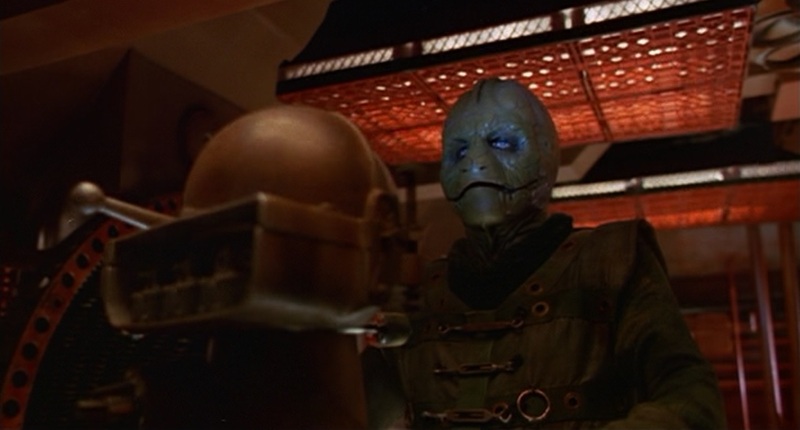 It makes a huge error in breaking the battle against Sador into two chunks; the momentum vanishes when they return to the planet Akir (as in Akira Kurosawa) for the respite between fights with Sador. The last half-hour of the movie drags. But it certainly didn’t drag when I was ten or so. This was one of those movies that was shown on HBO about thirty times over a couple of months and I saw most or all of it about twenty-nine of those times. I don’t know why bits of it were so unfamiliar this time around, though. I’d forgotten all about the collective-consciousness aliens who join the fight, but remembered Sybil Danning’s last line exactly. This is a movie that you watch when you’re a kid for all the space explosions and the illicit thrill of some mildly bad language because your parents see this and assume it’s more kiddie space junk and they don’t need to monitor it. There are other cute little bits. 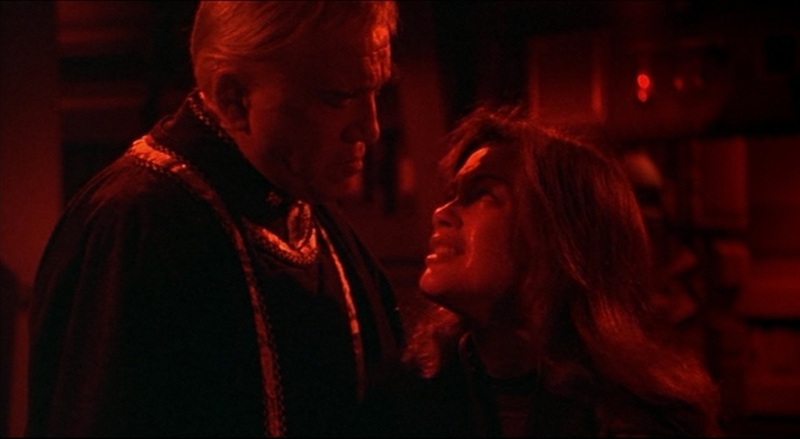 I like that John Saxon’s character is in search of a new arm, and there’s one of the all-time great “Show me more of this Earth thing you call kissing” scenes between Thomas and Darlanne Fluegel, in a very early role. George Peppard’s Cowboy character has a belt that dispenses scotch, soda, and ice. I nearly fell asleep during the last half hour, and my wife cringed and winced through the mess, as indeed she did with all the other outer space dramas we’ve watched this summer. But our son whooped and hollered and punched the air and had the best time in the galaxy again. He has, in that delightful way of six year-olds, decided that each and every one of the eight silly movies we watched during this season of cash-ins was better than the previous one, and this – this! – was the best of them all. I’d say that it’s not half as good as Starcrash or Message From Space, but it’s his opinion that counts the most. We’ll head back to Earth for our next few Sunday movies, but we’ll let him see the actual sequel to Star Wars one day next month, so stay tuned! I don’t know why in the world I never saw Disney’s The Black Hole in theaters as a kid, but I had about thirty of the bubblegum cards and convinced myself it was going to be one of the all-time greatest movies ever. The film eventually showed up on HBO and chunks of it kept me satisfied enough to watch it again and again. This is a movie where people talk way too freaking much. Worse, they are forced to deliver some really stilted and awkward dialogue. Early on, Ernest Borgnine is forced to say “How that must have galled Doctor Hans Reinhart!” Nothing else that comes out of anybody’s mouth is much better. It’s a hundred minute exercise in what Orson Welles once called “things that are only correct because they’re grammatical, but they’re tough on the ear.” I couldn’t even focus on the silly story because these terrific actors – Borgnine, Anthony Perkins, Roddy McDowell, Slim Pickens, Robert Forster in what would have been the Joseph Cotton role in other hands – are forced to deliver such painful lines. But watch this with a kid and you can ignore a lot of it. Our son was curious and fascinated at first, spent several agonizing minutes worried and concerned about the creepiness of the gigantic Cygnus, somehow locked in stationary orbit around a black hole, and then exploded with excitement once the gunfights began. And to be sure: they’re pretty darn good gunfights for kids. The iconography is, of course, straight from Star Wars. This has cute robots, quasi-stormtroopers, and a great big, menacing brute of a Vader Villain in the form of the Satanic red Maximilian. The robot is silent; it communicates with its power saws. It really is a great design for a robot. As V.I.N.CENT and B.O.B. are instantly identifiable as heroes – and why Disney hasn’t been selling V.I.N.CENT toys in its stores, I’ll never understand – then Maximilian just silently screams evil. It’s a real shame he’s not in a better movie than this. As our son jumped up and down, thrilled by the faux-troopers losing their laser gun battles, I wished this could have been better. I dislike how the movie drops science-sounding words into the narrative, like “event horizon” and “Einstein-Rosen bridge,” without considering how a movie that actually paid attention to science could have been a much, much better experience. Instead, a character mentions Dante’s Inferno early on, and that’s where this film wants to go, leading to one of the downright stupidest endings in movie history. No, this isn’t a good film, but the music is terrific, and V.I.N.CENT and B.O.B. are instantly charming and wonderful. I love their design and their characters. They are among my favorite of all the many R2-D2 clones in film and TV. The special effects are an interesting mix of then-state of the art computer-controlled motion control, traditionally animated lasers and rocket exhaust, and the wire work that Disney’s team had mastered on the Witch Mountain features, meaning your heart breaks whenever you see a string onscreen. It’s good enough to thrill and frighten children, but it should have been good enough to do the same for grownups. The rush to capitalize on those sweet, sweet Star Wars profits led to this terminally dull Canadian entry, which is more formally called H. G. Wells’ The Shape of Things to Come despite not having much of anything to do with any book that Wells ever wrote. It was filmed in the fall of 1978 for as little money as possible, leading to some charming moments like a bit where Carol Lynley, who plays the deposed governor of the planet Delta Three, tells all her subordinates on the studio set to wait there while she goes through a door on location to a power plant, where they couldn’t afford to take all those extras. It ticks the requisite boxes. 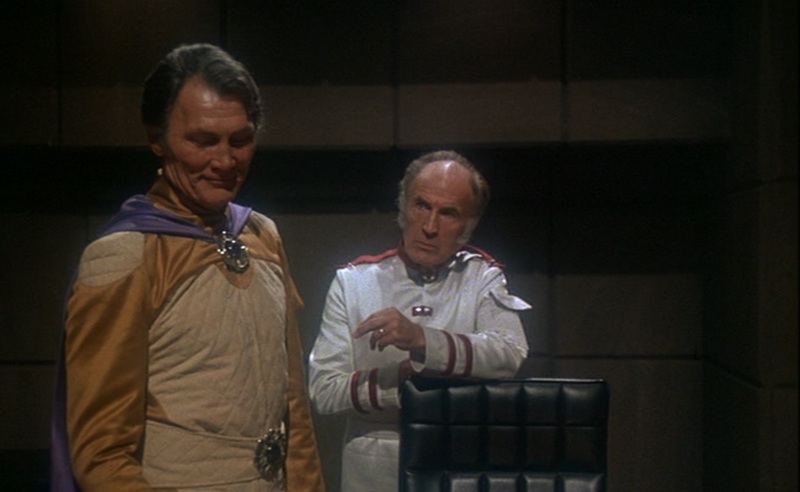 Barry Morse is in the Obi-Wan Kenobi role, with Jack Palance as the Vader Villain. There is a cute robot called Sparks and several similar dangerous ones that are painted black and kill people. In one surprisingly grisly moment, a robot batters a man to death with a great big rock. Big spaceships are filmed from underneath, so there was plenty here to cut into a thirty-second spot for afternoon teevee. Surprisingly, however, I don’t remember this movie at all. Sure, it’s been nearly four decades, but this was, of course, exactly the sort of film I’d see advertised on TV commercials and run screaming to my parents to take me to see. Our son mostly enjoyed it, but the brief upper hand that the baddies enjoy really bothered him a lot more than in similar stories. I think that’s in part because the circumstances are really grim – Barry Morse’s death scene is, while still PG-rated, a lot more graphic than Obi-Wan vanishing into the folds of his cloaks – but also because the good guys seem hopeless. Nobody has laser guns or light sabers, and the heroic leads, played by Nicholas Campbell and the downright gorgeous Eddie Benton, don’t seem to have any special powers or abilities at all, just luck. Another factor that might have bothered our son: the grim tone is really set by an honestly effective sequence set on Earth, which is by far the very best part of the movie. So the plot is that the Vader Villain has taken over Delta Three and now controls the radiation drugs needed on the moon colony. Our heroes leave the moon to confront him, but immediately have a fault and have to land on the polluted planet Earth, which had been ravaged by a robot war several years previously. They land in a remote mining camp where everything is still and quiet among the orange leaves of the trees, except for some strange, small shapes that the camera keeps finding, hunched over among the weeds. Campbell and Benton explore the isolated place looking for the operator, and it’s all shot like a truly excellent horror film from the period, not a bombastic outer space movie. Experience with this sort of story suggests that the shapes will turn out to be mutant raiders or something, but that gets subverted, too. It’s a real shame the whole movie couldn’t be as effective as this sequence. The director, George McCowan, mainly worked in television in the 1970s and regularly directed cop and detective shows like Cannon and The Streets of San Francisco. His work here suggests he was a bit lost trying to make killer robots and spaceships seem believable or threatening to grown-ups, but give him an old radio transmission tower and a couple of attractive leads somewhere in a quarry in Canada, and he could make something a little magical. Eventually, of course, everything has to blow up, because that’s what kind of movie this is. That thrilled our son much more than anything in the woods. 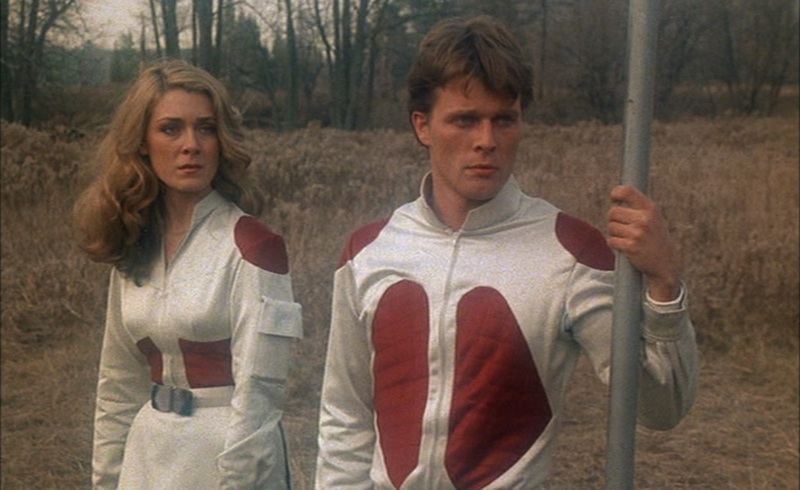 There are exactly two reasons anybody ever needs to watch Starcrash. Either they’re under ten and want to see laser swords and Vader villains and exploding spaceships, or they’re over ten and want to ogle Caroline Munro while she’s wearing several ridiculous, skimpy costumes. Well, alternately, a person could be stuck trapped on a sofa between these audiences. Poor Mommy. 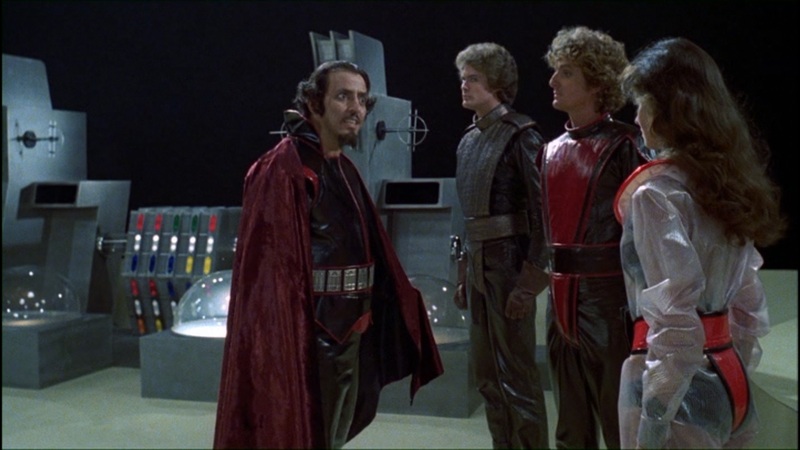 Starcrash is arguably one of those projects that began its long development before Star Wars, but nobody outside the producers’ immediate families is going to defend its originality. It even opens with a shot that’s been stripped right from Wars, only while the ships in that movie looked like actual spaceships, these look like toys. All of the miniatures here look like toys with the little leftover bits from model kits glued on them and given solid white or gold spray jobs. No, what money there was in this movie, after securing the services of Christopher Plummer, Caroline Munro, David Hasselhoff, and a bunch of other people who look like they were on a two-week furlough from the steel mill, went into the location filming. Munro plays Stella Star, a pilot and smuggler who’s been pardoned by the Emperor of the Universe and commissioned to find his missing son. The search takes her and her crew to a beach planet, an ice planet, and a volcano planet, where they get into battles with space amazons and space cavemen, before confronting the evil Count Zarth Arn, which might be the best and silliest name for any of the screen’s Vader clones. Speaking of best and silliest actually, and you won’t believe me, but my favorite part of this movie wasn’t actually Caroline Munro in her leather space bikini and boots, but the laser guns used by Zarth Arn’s troops. They have these absurd and delightful little red crosshairs printed on the barrels of their rifles and I chuckled every time I saw them. For our six year-old, this was serious business and he adored this film. He liked it just fine until the climactic space shootout, and told us that his favorite part was “the end, when everything went boom boom boom. I liked everything else, but I really liked it when everything went boom boom boom!” There are lots of explosions as all the extras and stuntmen shoot at each other in a set that looks about the size of our apartment, but which nevertheless somehow holds about a dozen of these little torpedo ships which crash through the living room windows of the Death Sta– I mean whatever Zarth Arn calls his space station — but that wasn’t the really big explosion. Our son also really enjoyed this movie’s obligatory robot. This sort of movie just wouldn’t be complete without one. It’s a police robot called Elle, voiced by Hamilton Camp in a possibly Texan accent. Like C-3PO, he worries and complains about everything from water to flying a floating city, but he also guns down amazons and cavemen. With the battle almost lost, Emperor Christopher Plummer realizes that there’s no alternative but to execute the dangerous plan of Starcrash. The other really great thing about this movie is the wonderful way that David Hasselhoff replies “Fourth dimensional attack!” You’d think that something called a fourth dimensional attack would be a little more impressive than two model kits bumping into each other, though. Starcrash was released in America by Roger Corman’s New World Pictures after the original producers, AIP, judged it too poor a movie to bother. It’s been a cult classic for almost forty years of mocking – some friends have been shouting “Fourth dimensional attack!” at inappropriate moments since the early nineties – and it finally made its way to Mystery Science Theater 3000 three months ago. I very much doubt my wife will ever sit through this film ever again, even with Jonah, Tom Servo, and Crow to help us through it. Incidentally, the unmistakable miniature work and silly Christmas light star systems in this film would, you’d think, be unique enough that nobody would think about using them anywhere else, but two years later, the visual effects all turned up again in a really dopey movie called Escape From Galaxy 3. It was apparently marketed in some countries as a sequel to Starcrash, but it certainly isn’t! And so, inevitably, there’s Battlestar Galactica. I had wondered whether that original three-hour opening “epic for television” might be available without having to buy the entire show; no look into all the Star Wars cash-ins would be complete without it. We were in luck: what we saw on TV as “Saga of a Star World” had actually already been shown in theaters in several other countries as a stand-alone film, and as an added bonus, it’s twenty minutes shorter. I’m sure you caught the connotations there: I think Galactica is the most tedious program ever. It doesn’t even have the decency to be downright stupid. It’s just boring. The weird thing at the time was that nobody in my second grade class was interested in it either. Obviously that wasn’t the case nationwide; Galactica had a legion of young fans who grew up to be a legion of adult fans, and they grew up to write and champion the even more boring 2004 remake. But somehow it didn’t click with the kids at my playground and get that lunchroom buzz that Star Wars had, and that Buck Rogers in the 25th Century would have the following season. Everybody watched “Saga of a Star World,” but people only talked about that in the past tense. I honestly don’t remember even being aware that a weekly show had been on at all. 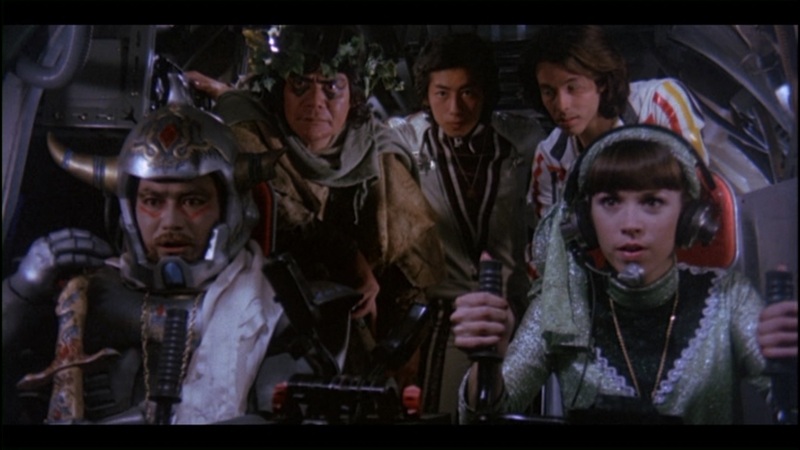 We all talked incessantly about Star Blazers and The Space Giants, but Galactica really seemed, to us, as a one-time thing as I recall it. Galactica 1980, though, that one everybody did watch. Kids, eh? And in 1981 or 1982, HBO showed a movie made from the two-part episode “The Living Legend” several times, and I sat down to watch it as often as possible, but not when it was originally shown. Anyway, in late 1977, Universal and producer Glen A. Larson started working on what was planned to be a series of occasional big-budget TV movies, only to have ABC decide to do it as a weekly show instead at just about the last possible minute. So the theatrical cut of the first story – it’s still long at 125 minutes – wasn’t just released ahead of the show, it was released before anybody at Universal even knew there was going to be a show. There are apparently several small narrative differences to the later TV version. 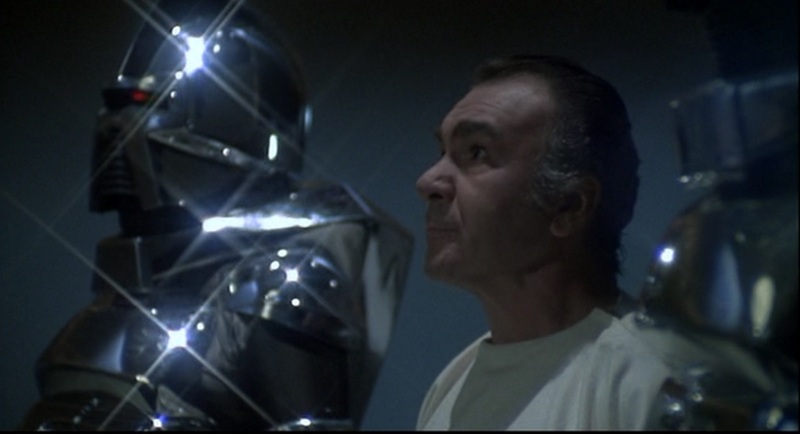 In the film, John Colicos’s character, the treacherous Baltar, is actually killed, but in the show, he survived to become the regular antagonist. 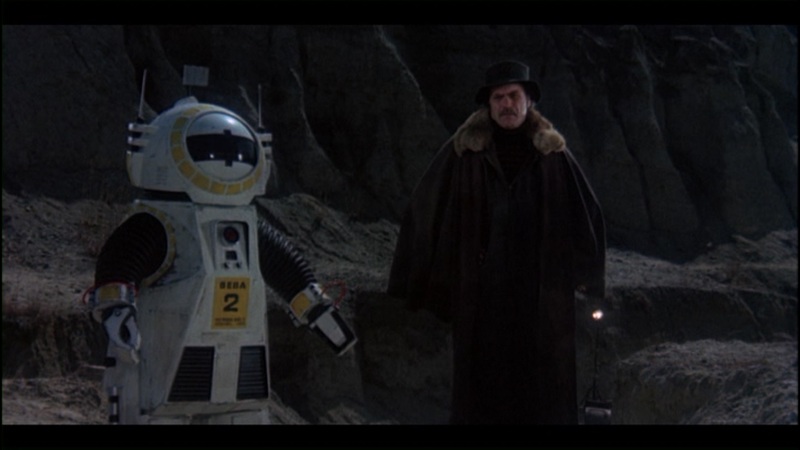 Colicos was probably a more interesting character than a barely-animated puppet, voiced by Patrick Macnee, would have been. Our son enjoyed this much more than I ever did, although the endless – okay, maybe five minutes, total – scenes of old men in pajamas debating the next course of action almost put him to sleep. Among the old men: Lorne Greene, Terry Carter, Ray Milland, Wilfrid Hyde-White, and Lew Ayres. The movie sensibly focuses on the younger and much more attractive cast. I like the way Glen A. Larson wrote his two male leads. Richard Hatch is the dream catch for any single moms in the TV audience, the reliable super-boyfriend to a young widow played by Jane Seymour, and Dirk Benedict, with his freewheeling attitude and silver tongue, is the bad boy, caught in an endless love triangle between Maren Jensen and Laurette Spang. Our favorite six year-old critic is mostly quiet during TV and movies and avoids interjections beyond cheers, whoops, and laughs, but he occasionally can’t help himself and it’s often amusing. Today, when we first see the heroes’ Colonial Viper fighter ships, he immediately said “Hey! Those pods look like X-Wing pods!” “Noticed that, did you?” I asked. Of all the Star Wars cash-ins, Galactica was probably the most egregious, prompting 20th Century Fox to briefly pursue a lawsuit over 37 alleged infringements. Most of these were pretty darn spurious, but lawsuits, like criminal charges, are often shotgun blasts hoping something will stick. My favorite interjection came during the climax, as Cylon ships are attacking the supposedly defenseless fleet and Maren Jansen shouts “There’s nothing to stop them!” The next shot is all the Vipers leaving the planet’s surface and our son said “Nothing except those!” He really got into the spirit of things. He enjoyed all the space battles, reused footage and all, although he was really confused when the Death Sta – I mean Cylon Base Star – was destroyed. They’d explained the imminent destruction of the planet by way of some lines dropped in, overdubbed atop a laser gun shootout, and of course a six year-old isn’t going to pay attention to the dialogue when our heroes and Cylons are shooting at each other. As for me, I wasn’t quite as bored as I feared. 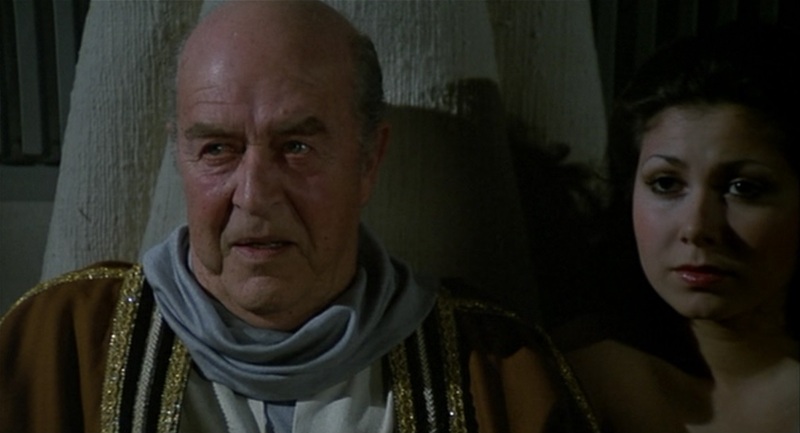 It’s always nice to watch Ray Milland chew up the scenery with that “I really do hate my agent” look in his eyes. I got a good chuckle when the words “MADE IN USA” showed up on a computer screen when Jensen was trying to diagnose a problem with Benedict’s ship. It’s certainly not bad for what it is, but any life in this movie vanishes when Dirk Benedict isn’t on screen. I remember always being disappointed that the insect aliens, the Ovions, had so little to do, and this still seems like a missed opportunity. Of course, when I was a kid and had an Ovion action figure to hang out in my Sears Creature Cantina with Walrus Man, Greedo, Hammerhead, and the tall Snaggletooth with the silver boots, I just wanted more four-armed Ovions attacking people, but now I want to know whether they were running a big counterfeit cubit operation in their casino to keep the winnings going. How did they target their advertising to get the high rollers to book vacations without anybody in the rag-tag fugitive fleet, even Ray Milland’s decadent greedheads, ever having heard of them? I honestly would have preferred more screen time devoted to these incredibly pressing questions than on Jane Seymour’s kid and his new robot dog, but my six year-old liked the robot dog and gave it his “pretty cool” seal of approval, which I doubt he’d have done with an in-depth investigation into Ovion casino marketing. Reckon Glen A. Larson knew what he was doing. It’s largely forgotten today, but if you want to sit down with a kid and enjoy a downright insanely entertaining movie, Message From Space will certainly do. After those last two turkeys we watched for this blog, this was both a relief and a pleasure. This is a fun, fun movie, almost tailor-made for slow Sunday mornings for kids to watch on a UHF channel while Mom and Dad are still asleep. 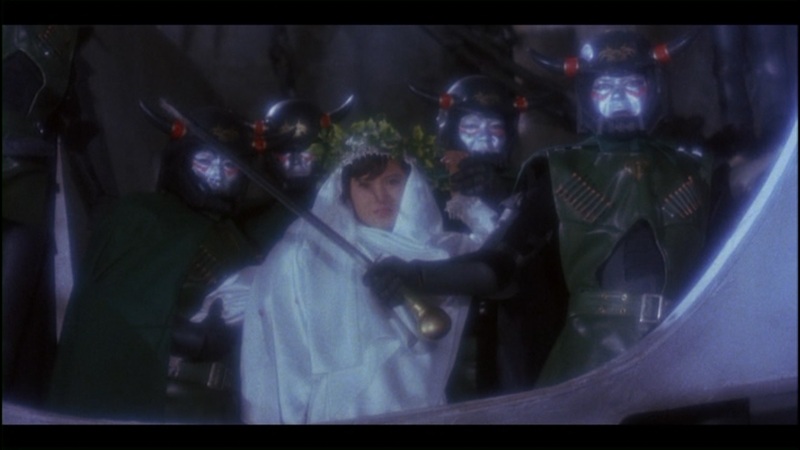 You know how Star Wars is really inspired by Kurosawa’s The Hidden Fortress? This is a movie that doesn’t pretend. It’s The Hidden Fortress in space, gleefully pilfering its look and set pieces from Wars and running at breakneck speed with explosions and sword fights every five minutes. Anybody who’d get bored watching this film didn’t have an attention span in the first place. The plot goes like this: evil space villains have conquered a peace-loving planet, and the defeated people’s ageing leader sends eight seed pods into space to recruit help. The baddies follow the trail from their region of space into ours, and while the seeds collect a rag-tag group of misfits to fulfill their destiny, the villains learn about the beautiful planet Earth and decide to conquer it next. Among its international cast, it’s got Sonny Chiba and Vic Morrow, and a young American actress named Peggy Lee Brennan in a role that looks like it was written for Suzy Quatro. Our son adored this film, of course. I mean, if you like Star Wars, here it is again, only with old-fashioned miniature effects instead of computer-controlled one, and with a climactic sword fight that is roughly a billion times better than the one Dave Prowse and Alec Guinness had. It’s got both a Vader Villain and his creepy old silver-skinned mother in a wheelchair, beat-up and dirty little one-man spaceships, cocky hotshot pilots, a musical score that sounds a whole lot like John Williams, and a Death Star trench climax that’s pilfered straight from the original, only using about a quarter of the screen time and including giant doors in the tunnels that threaten to close right in front of the quasi-X-wings. So when the flying fortress meets its destructive end, he jumped off the couch in ecstasy, and bellowed “I TOLD you it was a hunk of junk!” He was happier about that than the downright amazing end for the chief Vader Villain, weirdly. Message From Space sports a co-writing credit for Shotaro Ishinomori, a comic book artist who spent the seventies being consulted by lots of TV and movie producers in Japan, and collaborating on all sorts of shows that look incredibly fun and/or silly. This is absolutely a fun movie, one I was happy to revisit. It’s not high art, but neither’s Star Wars, and every six year-old in the galaxy should see it. 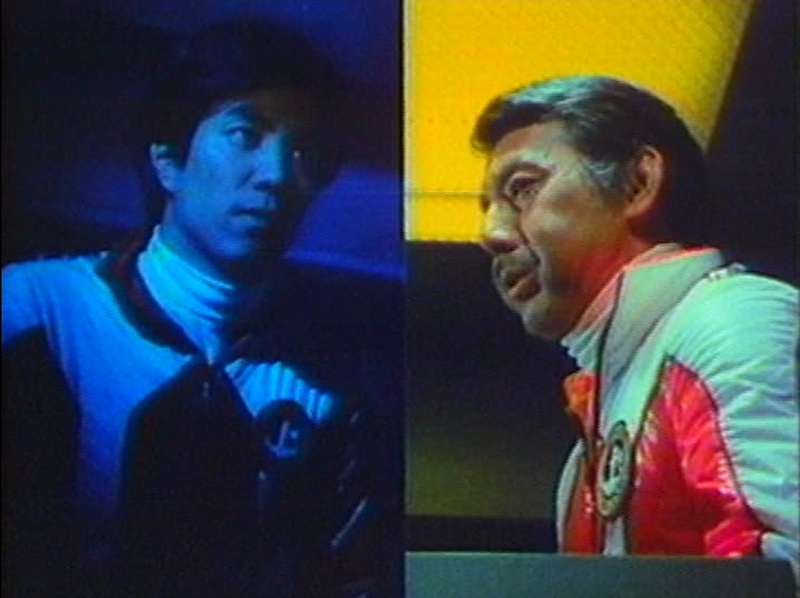 In the 1970s, Tsubaraya Productions made several sci-fi television shows apart from their most popular franchise, Ultraman. I don’t think that any of these really need trouble your attention much. There was Mighty Jack, of course, and Jumborg Ace, and Time of / Army of the Apes, and the see-it-to-believe it Dinosaur War Aizenborg, in which cartoon characters save the world from live-action actors in dinosaur costumes. That would have been a silly series in the first place, but then somebody decided that these needed to be talking dinosaurs. Recognizing that I’m not the best candidate to debate the issue, Star Wolf was probably the best of this unfortunate bunch of lousy teevee shows. The premise comes from a trio of novels by Edmond Hamilton. Centuries in the future – well, possibly, the English-language script is very, very questionable – some aliens led by Lord Halkon attack the Earth. One of their “Star Wolf” raiders, Ken, gets into a fight with his colleague about whether to murder civilians, goes rogue and joins Captain Joe and his crew to save the galaxy from his former allies. 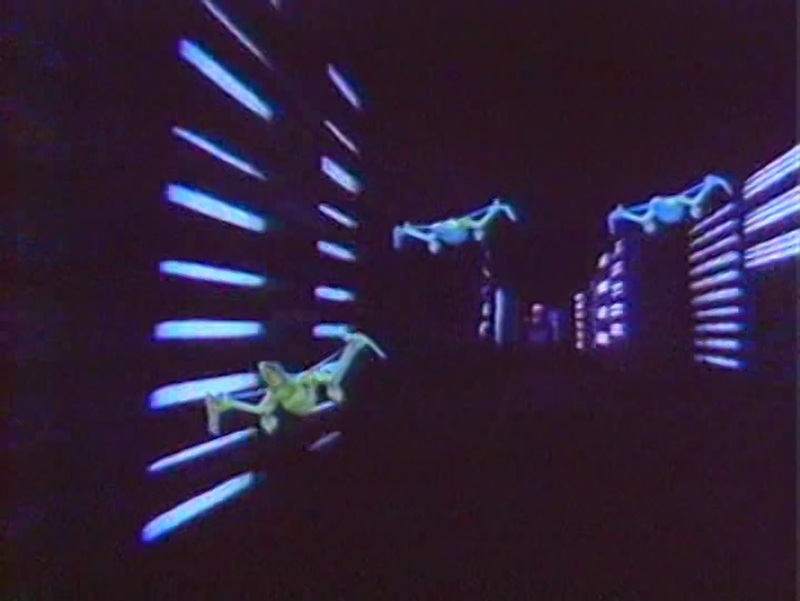 Star Wolf ran for 24 half-hour episodes in the spring and summer of 1978. Regardless of the story’s origins in Hamilton’s novels from the late sixties, the show’s design was all Star Wars. There’s a Vader Villain, ships that look like X-Wings, other ships with the Millennium Falcon’s cockpit windows, laser guns, even a light saber in one tiny bit. It’s a derivative and silly kids’ show, but for all I know, the original series might not have been too bad. Some of the miniature work is really pretty good. But we may never know whether the original program was worth a darn, because this wasn’t released in English by a company that knew to hire Peter Fernandez and Corrine Orr to do the voices and edit out as little as possible. No, the English language rights to most of the seventies Tsubaraya shows were purchased by Sandy Frank, the source of all our pain, and if there was anything worth watching in Star Wolf, it’s not evident in what came next. Fugitive Alien is a 100-minute compilation of the first several episodes of Star Wolf, and it is a breathtaking mess. The film was packaged and offered to UHF stations in 1986, and it is so incompetent that Mystery Science Theater 3000 did it twice, and watching it without Joel and the Bots is like a day without sunshine. The voice actors are probably Sandy Frank’s neighbors gathered around a condenser mic, the script uses “country,” “nation,” “planet,” and “constellation” interchangeably, people describe characters as not wearing space suits when they plainly are, that sort of thing. Our son tolerated it. My wife went to the grocery store. He was attentive in the beginning, when Lord Halkon has ordered his forces to destroy all life on Earth – his forces just rob a jewelry store and steal some gold bars, so that command might have been a quirk of the Sandy Frank script – and paid attention again when Ken gets arrested on the Planet That’s the Middle East, but the forty-some minutes between them are ponderous talking scenes in office buildings. Well, Rocky tries to kill Ken with a forklift, so I guess you could say that something happens then. Magically, you can tell from the costumes and design and cars that the original series, much like Ultraman, was set in the near-future, with technology we could imagine as right around the corner from the present day. So you’ve got average joes in 1977-78 clothes riding around in Jeeps watching slideshows and punching up information on TRS-80s talking about their centuries-old alliance with the Planet That’s the Middle East. The film does have an actual ending, but it also says “To Be Continued.” I did not break my son’s heart when I told him I did not have a copy of Fugitive Alien 2 and that we would not be watching it. I’m a nostalgic and forgiving kind of guy, and so I’m pretty certain that every single thing from my childhood that I loved as a child is something I can look at from the dull light of middle age and see what appealed to me when I was small. 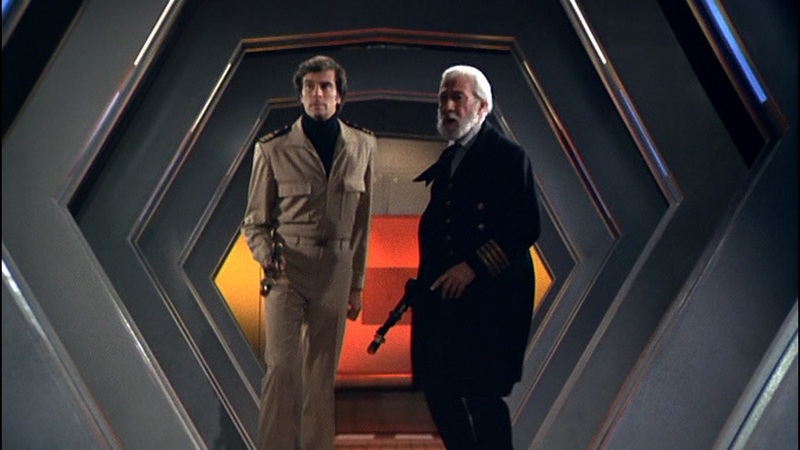 Then there’s The Return of Captain Nemo, which ran for three episodes on CBS in 1978. I saw the first two installments and loved that show like you wouldn’t believe. This morning, we watched The Amazing Captain Nemo, a compilation movie made from the three TV episodes, whittled down from about 150 to 105 minutes. If I didn’t have my six year-old son hopping with excitement from the laser gun fights, underwater action, and explosions, I would have wandered away from this turkey to go play mublety-peg or something. I’d say that it’s the stupidest thing we’ve watched for this blog, were it not for the unfortunate reality that I know what we’re watching next week. 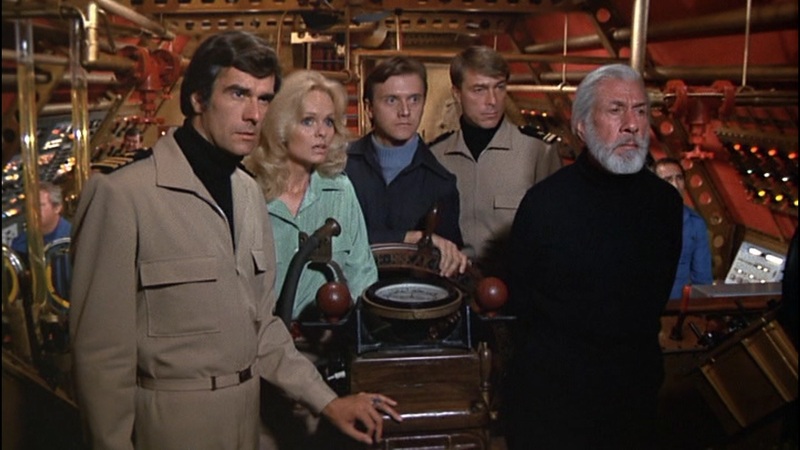 The Return of Captain Nemo seems to have come about because CBS was very much aware of bandwagons, but they were too timid to actually jump on any of them. In the spring of 1977, NBC showed a series of TV movies called Man From Atlantis. 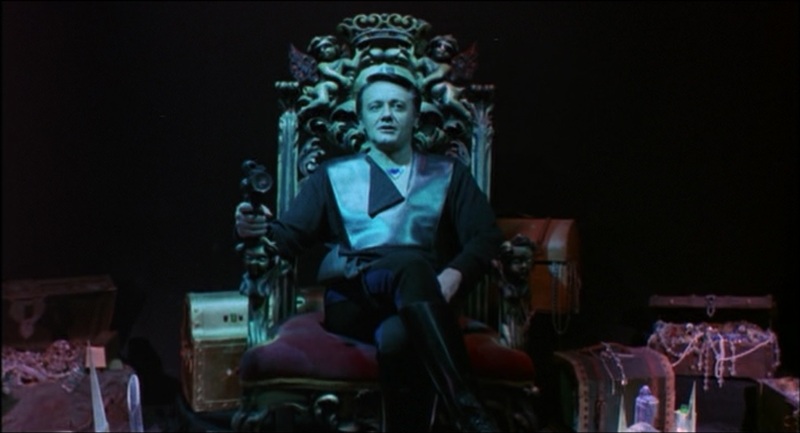 They starred Patrick Duffy as a comic book-type hero, with a former Batvillain, Victor Buono, as a recurring enemy. 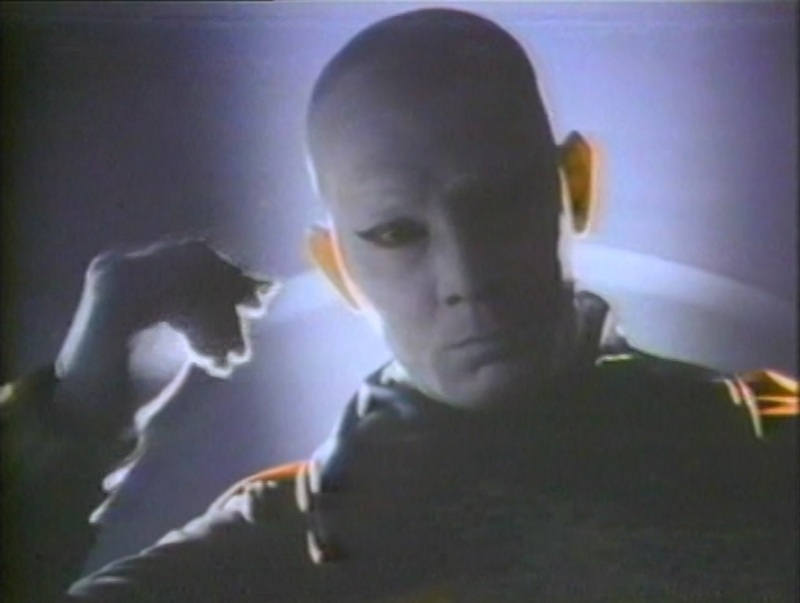 These were so successful that NBC ordered a weekly series, and CBS and Warner Brothers followed suit with an idea for a clone, even casting another former Batvillain, Burgess Meredith, as their show’s baddie. Captain Nemo was in the public domain, and while Irwin Allen had left weekly TV production behind for big-budget disaster movies like The Towering Inferno, he knew how to make bottom-of-the-sea television without a lot of money, so they asked him to produce it. Then Star Wars happened. 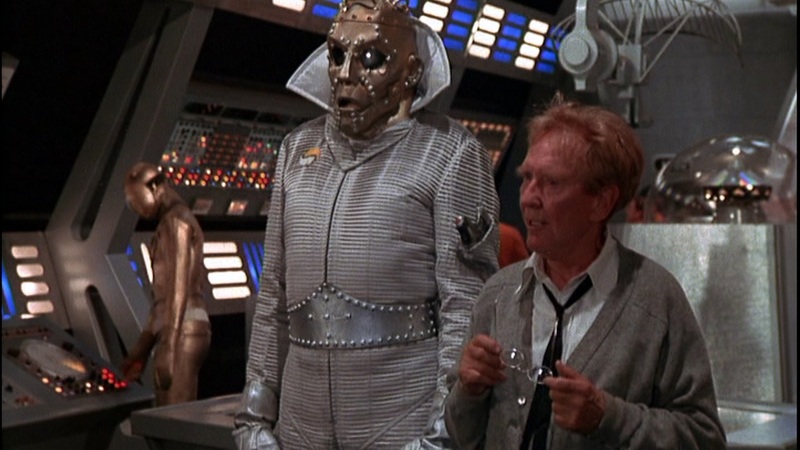 Suddenly Burgess Meredith got an alien robot henchman and a lot of golden androids. The important rooms of his submarine, the Raven, got turned into black-curtained “limbo” sets like everywhere in the third season of Batman so the set designer could spend money making all the corridors into Death Star hallways to stage laser gun shootouts. Then Man From Atlantis died as a weekly series. CBS decided that they maybe only wanted three episodes, and called it a pilot mini-series. 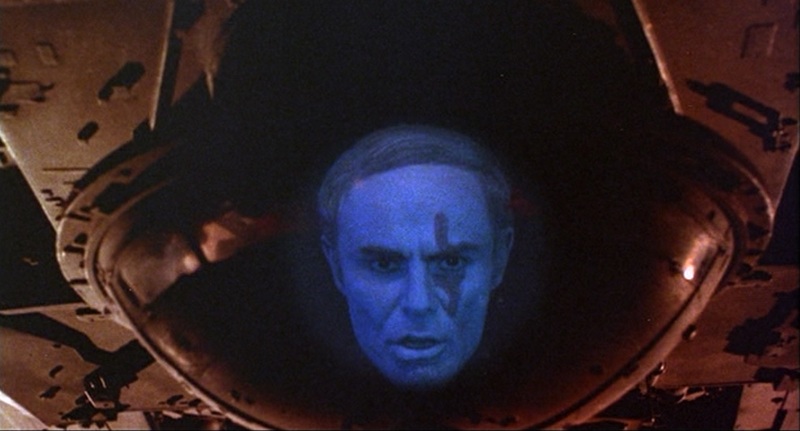 The mini-series flopped, and Irwin Allen and Warner Brothers got to make a little money back by turning the three hours into a film version, cropping the 4:3 picture into widescreen. The three-part version has apparently never been screened anywhere since an April 1981 broadcast in the UK; the film is the only way to see it. Only Irwin Allen completists need bother. I’m assuming some of the intricacies must have been lost in the editing, because the speed with which the kind and patient Nemo works out a deal with naval intelligence to be their go-to man to battle the evil Professor Cunningham is really the most amazing thing about this movie. We never learn anything about Cunningham’s alien buddies or weird technology, Lynda Day George is present only because if she wasn’t, there would not be a single female character in this movie at all, and Atlantis itself is treated as a mild curiosity and depicted with a no-budget-at-all white set with two Greek columns. All of the dialogue is hilariously macho – “I’m going alone,” “no time for explanations,” etc. – and the two action man leads, played by Tom Hallick and Burr DeBenning, look like they were cast because there weren’t any cop shows that needed them that month. But holy anna, our six year-old loved it. He was hopping up and down and shouted “This is AMAZING!” at one point. He liked the underwater gunfights so much that he’ll probably pass out when he sees Thunderball one of these days. He did creep behind the sofa at one point when Captain Nemo was captured and Cunningham uses one of those mind probes you see in sci-fi shows to get the equations and blueprints for the Nautilus and its laser(!) from his brain. We’ve seen Captain Nemo in four films now, and this is the most ridiculous thing to happen to him in any of them. And it was always thus. In the seventies, my parents were good friends with a fellow named J.D. Faulkner, who always confused me by being unmarried. My folks knew nine thousand people and I swear J.D. was the only bachelor among them. He always arrived unannounced, and one terrible Wednesday – March 22, 1978 – he showed up raving about this restaurant in Marietta, insisting that Mom and Dad drop plans and join him there. It is perhaps amazing that I grew up loving food and restaurants as I do after what happened next. This insidious trip to whatever that restaurant was – my parents never admitted its name under interrogation – cost me the third episode of the show, but I guarantee I ruined their meal by whining about it. I started crying because the second part had a cliffhanger ending. I mean, it said on the screen “TO BE CONTINUED,” so that meant my parents were obliged to let me see what happened next. 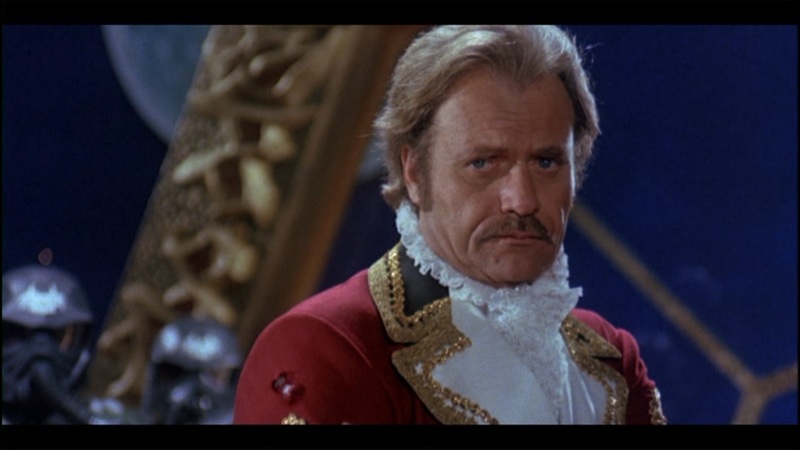 Somehow, in that strange logic of six year-olds, I concluded that the cost for missing part three of The Return of Captain Nemo was twenty-four dollars. My father agreed to pay it to shut me up, and I ate my spaghetti in silence. It wasn’t even good spaghetti. Mom made better spaghetti than this. Mom made, and continues to make, better spaghetti than anybody else on the planet. I don’t know why I ordered it. Then my dad refused to pay the twenty-four dollars. Then there wasn’t an episode four of The Return of Captain Nemo. Somehow I didn’t become a serial killer.